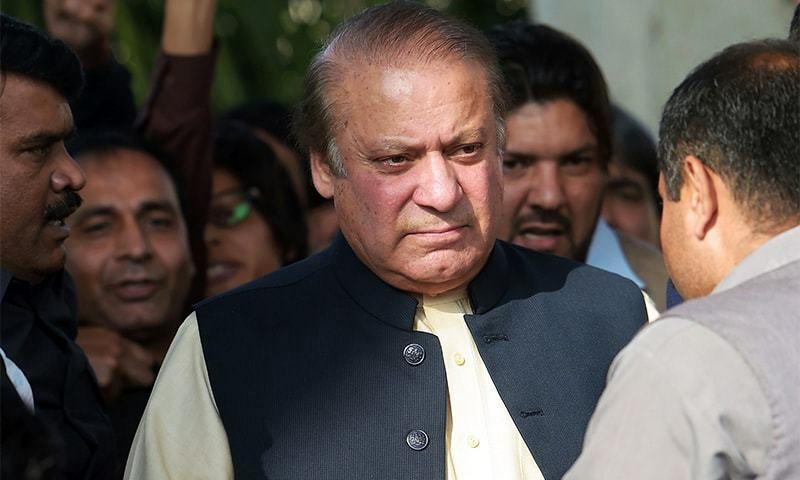 Senate elections are around the corner, and the PML-N — which seems set to become the largest party in the Upper House of Pakistan’s parliament — is already crying foul on horse-trading, especially in the backdrop of the sudden recent change in the Balochistan government. But, despite the Senate elections holding immense importance in the national debate right now, little is known about how they are actually held or how the process works. The Senate — the Upper House of Parliament — is a body of 104 lawmakers. Each serves a term of six years, barring resignation, disqualification, or other extraordinary circumstances. They are not all elected at the same time: rather, half are elected at one time, and the other half three years later. In 2018, 52 senators (who were elected in 2012) are slated to retire. The other 52 were elected in 2015 and will retire in 2021. Of the 52 Senate seats being vacated for election on March 3, 46 will be filled by the four provincial assemblies, 2 by the National Assembly, and 4 by lawmakers representing Fata. Each provincial assembly will elect 7 senators on General seats, 2 on Technocrat seats and 2 on Women seats, for a total of 11 seats. Two provinces (Sindh and Punjab) will additionally also choose a Minority member each. Additionally, Fata MNAs will elect four senators, all on General seats, while the National Assembly will elect two members from Islamabad (one to a General seat and one to either a Woman or Technocrat/Ulema seat). Among the candidates, 20 are from the PPP, 14 from the MQM, 13 from PTI and four from Pak Sarzameen Party. In addition to this, 65 candidates will be contesting as 'independents', which includes the 23 candidates nominated by PML-N who cannot contest polls on their party ticket anymore. Twenty candidates are contesting the polls from Punjab. Of these, 10 will contest for General seats, three for Women's seats, five for Technocrats' seats, and two for a seat reserved for minorities. A total of 33 candidates will contest the Senate polls from Sindh, of which 18 will contest for General seats, six each for seats reserved for Technocrats and Women, and three for a seat reserved for minorities. The votes received by each candidate are tallied in each count. When a candidate receives enough votes to cross the quota, the extra value of his or her votes is transferred down to lower priority candidates (in the order mentioned by the voters). The candidates who receive the fewest votes are eliminated and their votes are transferred to other candidates in the order of preference mentioned by their voters. A senate hopeful from Punjab, on the other hand, will need 46 votes from the Punjab Assembly to win a General seat. This difference in the required number of votes is due to the different size of the two assemblies. *Number of votes required to be elected to a General seat. Header photo design by Nabeel Ahmed. Let’s say we’re electing senators for General seats from the Khyber Pakhtunkhwa Assembly. There are 7 seats to be filled. You have the Khyber Pakhtunkhwa MPAs as your pool of voters (the electoral college), and you have a list of candidates they will be voting for. Details on the procedure have been taken from various ECP documents. Candidate names, party affiliations and scenarios are purely fictitious. The first thing the Election Commission of Pakistan will do is it will assign a value of 100 ‘points’ to each vote. Assuming they all turn up to vote, this means that KP’s 123 lawmakers will have [123*100 =] 12,300 points to allocate in total. Next, the ECP will determine how many points a candidate will need to win a Senate seat. This is called the Quota. The formula ensures that there will be only 7 winners, as only 7 candidates can possibly secure a minimum of 1,538 points without exhausting the total points available. The next thing that needs to be understood is how the points will be allocated. Each voter is given the option of voting for multiple candidates, but they have to mention an order of preference for their choices. On the first count, each candidate mentioned as the ‘first preference’ will be given the full 100 points of that vote’s value. In order for a candidate to be elected on a General seat from KP on the first count, a candidate will need at least 16 votes (this will give the candidate 1,600 points in total, 62 more than the quota). PTI’s Zaman, Mohammad and Iqbal have, under the formula, secured more points than the required quota. They shall, therefore, be declared winners on the first count. Three of the 7 General seats are now filled. Four are still left. To fill the remaining seats, another count needs to be held. The returning officer will look again at the votes that have been cast to take into account all the ‘second preference’ votes. Hassan Iqbal has received the highest number of votes (17 votes=>1,700 points) and has ‘surplus’ points (162 above the 1,538 point quota). These surplus points will now be transferred to the second preference candidates on the votes he has received. The returning officers will divide the surplus points between all the votes Iqbal received, ignoring any fractions. This means his 162 surplus points will be split between the 17 votes he received. If any of the votes he received did not indicate a second preference, the surplus will be divided between the remaining votes. Let's assume one voter did not. Therefore: 162 (surplus points) / 16 (number of votes the surplus points can be transferred to) = 10 points to be transferred to the second preferences mentioned on each vote that Iqbal received. Now, let’s assume that the voters whose first preference was Iqbal mentioned the following candidates as their second preferences. Since Shabbir Mohammad and Rafay Zaman have already been elected, the Returning Officer will look at the third preferences on the ballots in their favour, which, let’s assume was Mohammad Lateef (on the 2 votes that went to Mohammad as well as on the 1 vote that went to Zaman). This translates to 13 votes transferred to Lateef (10 second preference votes and 3 third preference votes). Each of these 13 votes will transfer 10 points to his tally, meaning a total of 130 points have been transferred to Lateef. The surplus for the other candidates who won in the first count — Zaman and Mohammad — would be dealt with in a similar fashion. Since there are no more surpluses to be dealt with, we move on to the next step: elimination of candidates with the lowest votes. In our example, PML-N’s Sohail Abid and Naeem Ahmed, as well as PPP’s Kaleemullah, have received the fewest votes. The simplest way for an RO to eliminate a candidate is by drawing lots. Let’s assume Naeem Ahmed is eliminated through this method. The points received by the eliminated candidate will now be transferred to others. In our case, Ahmed received 100 points from the single vote he received. Let’s assume the voter who voted for Ahmed as his/her first preference marked Ali as their second preference. Ahmed’s points will then be transferred to Ali. But no new person has managed to cross the 1,538 points quota, which means the elimination will continue. The next to go will be Sohail Abid and Kaleemullah, followed by Junaid Hafeez and PTI’s Qadir. 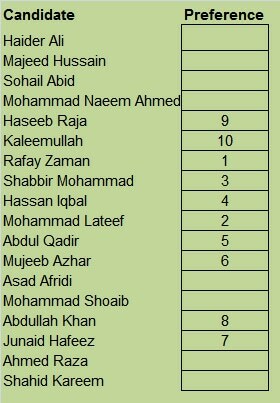 Let’s assume the second preference for those who voted for Hafeez was Abdullah Khan, while Sohail Abid’s points will go to Ali. Kaleemullah’s points are assumed to go to Raja. While the process of transferring Abid, Kaleemullah and Hafeez’s points is simple, Qadir’s is slightly more complicated because he received different amounts of points from first and second preference votes. The two first preference votes he received shall be transferred at their original value of 100 each. The 3 second preference votes will be transferred at the value of 10 points each — which is the value they were transferred at to him — and the 14 third preference votes at the value of 3 points each. Let’s assume both first preference votes for Qadir go to Lateef, along with 2 votes valued at 10. The remaining 14 votes, valued at 3 each, go to Mujeeb Azhar (14*3 = 52 points transferred). Since this still does not take any candidate across the quota line, let’s assume Majeed Hussain is also eliminated and his 300 quota points now go to Ali. Since Ali achieves the quota, he shall now join the three PTI men as a elected senator from the KP assembly. His surplus will now need to be transferred. However, it won’t be transferred back to all the votes he has received up till this point, but only to the votes that took him over the finishing line (the votes from the most recent count). If all three of these votes had mentioned their next preference as JUI-F’s Asad Afridi, his points tally would rise to 1,260. With none of the candidates still having reached the quota, another round of elimination would follow, and Mohammad Shoaib would have to give way. Afridi will also be elected and his surplus of 122 points will require a transfer, with each vote carrying a value of 30 [(surplus/number of votes received in most recent count)=> 122/4]. We assume all of these points will go to the JI candidate Abdullah Khan. But this would still not create any surplus, and another round of elimination would follow. The victim this time would be ANP’s Shahid Kareem, whose votes are assumed to have been transferred to Lateef. Lateef is now elected, leaving only one other seat to be filled. The rule for the last seat to be filled in is simple: the candidate with the highest points is declared the winner. In our example, QWP’s Raza would be the last elected candidate, since he had the highest number of votes among all remaining candidates. In case of a tie, lots would have to be drawn. The same voting system will be followed for all the other seats, with the quota (required number of votes) changing to reflect the number of seats waiting to be filled. The biggest criticism that the Senate election procedure faces comes because of the room for horse-trading — buying votes — that it leaves. This essentially stems from two of its key features: indirect elections and secret ballot. Secret balloting means no one knows who the voter (lawmaker) marked as his/her preference. This allows for voters to vote for candidates other than their own party's candidates. But what really irks critics — and now increasingly politicians — is the indirect elections part. Simply put, by reducing the pool of voters from millions to hundreds, indirect elections also reduce the number of people you need to 'buy' to get elected. It is also why so many rich independents try their hand at elections. The issue has especially gained traction this time around owing to three main factors — the overthrowing of the Zehri government in Balochistan, PML-N candidates being forced to run as independents, and the cracks within the MQM. 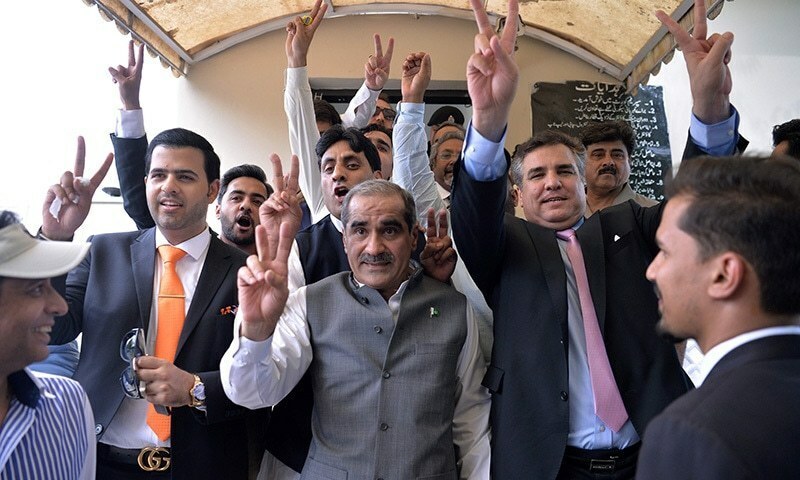 This means that a number of MPAs from Balochistan elected on PML-N tickets, those secretly upset in Punjab, and those in Sindh who have joined the PSP or are stuck in the middle of the Bahadurabad-PIB drama, are all potentially susceptible to horse-trading: ie, selling their votes to the highest bidder. This aspect has invited criticism from a spectrum of notables with political clout, such as PM Shahid Khaqan Abbasi, Imran Khan, and former ECP officials and Senators. Critics, including Abbasi and Khan, have suggested direct elections could curb the practice of horse-trading. OMG I almost haad a brain haemorrhage reading this process, and the people who are casting the vote might not even be able to.count to.hundred... this is such a pathetic process..
what you expect from senators who comes in power by spending thousand of money!! Bunch of thrives and killers. Can't even look at the picture. Great work Ebad Pasha/ Dawn. I am not sure why this process has been made so complex? Why not these people are elected by people votes like general election. This process is an clear example of inviting corruption and horse trading. Bless you ,people at Dawn . Many atimes have i been shamed by some for not knowing the exact procedure followed during senate elections . Thank you for putting in the time to compile this tutorial . Why are we wasting money on senators. What is their job? Why senate voting is not done openly as are done in NA & PA voting. Senate election is a source of horse trading and bribing. What is the transparency in senate election. Every time senate election is held billions of rupees exchange hands. Thank you for a very elucidating article. Really helpful in understanding this process. How much it cost to become a Senator? Do Senators get paid or voluntary job? What Senators do for tax payers? Well articulated piece of writing. These and the majority are just self serving and incompetent. Very little they do for the public. There has to be standards to judge their performances since each one gets rupees 150000 per month. Good article for us to understand. Thanks Dawn. Why the process is so complicated? If the purpose is to bring patriotic, honest, Trustworthy, and capable into the senate why not simply merit????? Due to the process so many black sheep slid under the door. It is a trillion Rupees game.Please throw some light on the money spend on this selection specially Balochistan,KP and Sindh. good report. One thing missing. How much it costs to become a senator? Who gets the money. I have a few million US$ in my account and will be happy to buy a seat. The so called democratic process is shameful, pathetic and the people who get elected in senate by group of thugs, in-capable so called elected members. These people with support of system left by colonist operated by civil servants is exploiting people, stealing resources, defaming the country. These power mongers and sell outs had systematically pushed out the smart critical mass of the country which is excelling globally. They achieved this by implementing Quota system, destroying industry, depriving common people from all resources, and keeping masses uneducated and in fact slavery like conditions in rural part of country. Hopefully SC and with the help critical mass can reverse this soon. The system and procedure speaks for itself! How many of these Senators are well versed with the constitution to conduct a tutorial class of students of Political Science? This is where bureaucracy comes into ply or may be play! My word how on earth is anyone supposed to understand this. Understood the process finally , great job. Senate elections are the dirty dancing of Pakistan's politics. They should be done away with forwith and Chairmen District Councils be designated as defacto Senators in addition to their own functions. It will save horse trading and lot of money for the exchequer. senate and senators are just burden on national exchequer. Thank you, Dawn! Excellent piece! Informative Article explaining the complex voting process for Senate elections. Thats why I like dawn......it uses Data Science tools more than any other newspapers in the country. Direct elections is the only answer. Woww... Couldn't even imagine it was that complicatedt. Hats off to whoever made this brilliant informative piece. I failed to understand the procedure which is mind boggling. I just lost the track of reading this election. Very high chances of horse trading. It is election of candidates with out common person representation. No wonder bids are made for each vote and bribes are offered for highest bidder. This system should be abolished and voting for the upper house should be done at the same time when general election are done for the National Assembly.